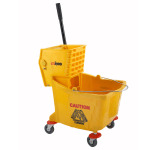 Having a clean atmosphere with the aid of a mop bucket and wringer provides your customers with comfort and an assurance that their well being and pleasure is in mind. Sanitary environments are key to any restaurant looking to survive in today's marketplace! For added convenience to your routine cleanings or even on the spot clean up this Rubbermaid mop bucket and wringer is ready to serve you. This 35 quart mop bucket and wringer is mounted on non marking casters and provides a portable approach to floor surface cleaning! The lever style wringer gives you the power to empty excess water from your mop with one simple action. Add this mop bucket and wringer combo to your cleaning regimen today! "We use it for our convenient store and my little Drive-in. Its small enough to use around where I need it and easy to use. Thanks!" "i enjoyed the product, thanks"
I liked how easy it is to use.